After four days on the water, our group reached the confluence of the Yampa and the Green. A confluence, or the joining of two rivers, makes a stronger, more diverse current. Confluences occur all throughout the Colorado River system. Much like the union between the Yampa and the Green, Western’s Recreation and Outdoor Education (ROE) students came together with the guides at Adrift to create a rich learning environment. 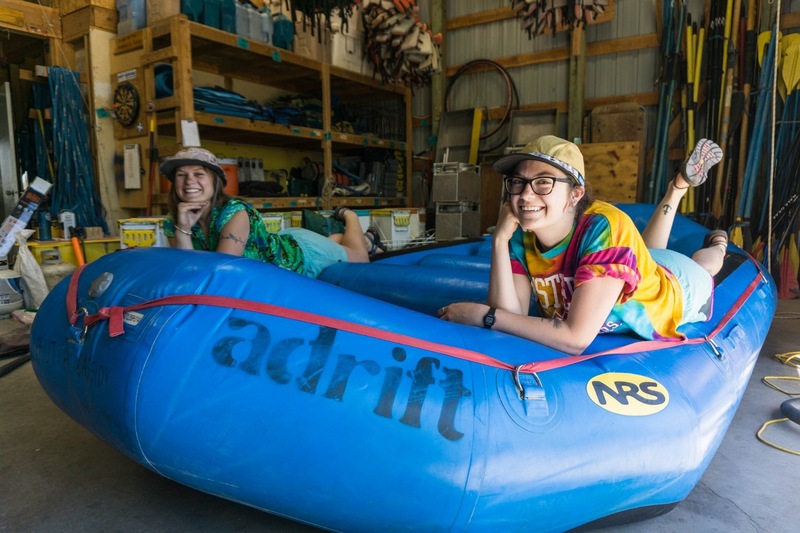 This special confluence of thought began to take shape twenty-eight years ago when Western’s Program Director, Mark Gibson, worked for Adrift as a guide, planting the seed that would grow into the symbiotic relationship Western now has with Adrift Dinosaur. Javier Placer and his partners at Stand Up Colorado bought Adrift Adventures two seasons ago. Javier embraced the standing relationship with Western and supported its continuation. By having the Western trip be the first trip of the season, ROE students are able to see all of the background work of opening an outfitter. The first few days of our course involved helping Adrift open for the season. We were able to blow up all of the boats and fit the oar frames to them, do various inventory, and all the other tasks necessary to get the boat house up and running. Javier believes that the partnership that exists between Western and Adrift allows for the history of Western grads coming to guide for Adrift. A perfect example of this synergy is our Trip Leader, Dan Mercier. Dan graduated from Western’s ROE program in 2012 and this will be his third year guiding with Adrift. 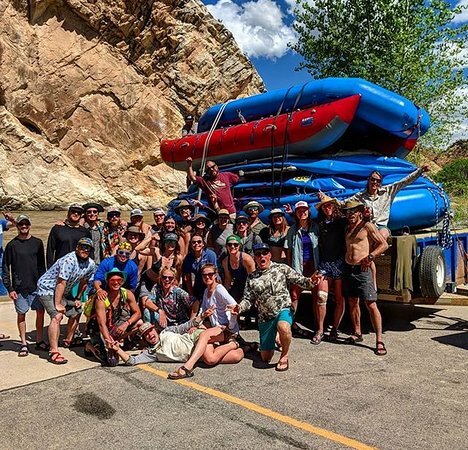 Dan began rafting with friends when he first arrived at Western, and later started raft guiding in Gunnison. When Dan went on his Water Based course, he fell in love with the beauty of Dinosaur National Monument and knew he wanted to guide there. Dan expressed that he was “very excited to be guiding, coming full circle with the Western students and being a part of this experience on the other end of things.” Taking this course makes working in Dinosaur a very real possibility for passionate and excited students. During our first days at the outfitter, we were able to witness a class of fourth graders from Davis Elementary in Vernal, Utah, release endangered species of fish back into the wild; they had raised Bony Tailed Chubs and Razorback Suckers in their classroom over the course of the year. It was amazing to see students being influenced to care about the environment and understand the fragility of a river’s ecosystem, especially at such a young age. To celebrate the release, the students came together to perform a beautiful musical arrangement with various musical instruments. Music was an integral part of this course as a whole. With any Mark Gibson class, there is always an assortment of percussion instruments that come on course. Most nights, we would have drum circles, and we even to bring some djembes, a type of African drums, on the river with us. The drums were used to create memorable moments, like breaking our silent float in Echo Park with a thunderous eruption of drumming. 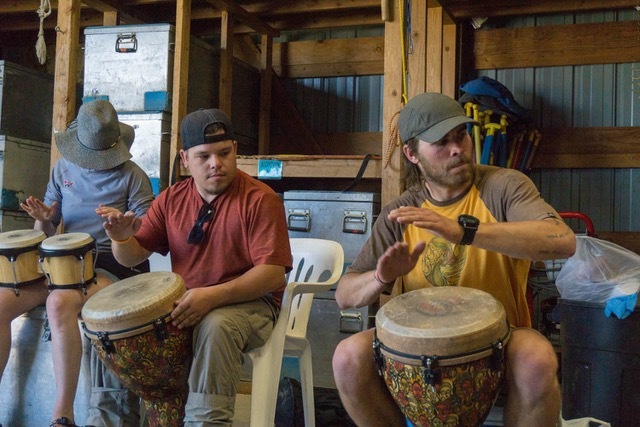 Amazingly, Professor Gibson was first introduced to the connective properties of music while guiding on the Yampa; one season, a fellow guide brought along a few drums and taught Professor Gibson some basic rhythms, and his love for drumming was born! This same guide made Gibson his first drum, which has since grown into an impressive collection. The pre-river days were full of prep work like packing, food shopping, and general logistics. However, they were not lacking fun! In addition to the fourth graders’ endangered species release celebration, our class made a trip to Dinosaur National Monument’s Quarry. At the quarry, we were able to learn about the history behind Dinosaur as a protected environment, which can all be traced back to Earl Douglass. In 1909, Douglass first found dinosaur bones near the top of a ridge of Morrison sandstone, beginning the excavation that later became the quarry. Now, the quarry allows for some of the bones and fossils to remain protected and viewed by visitors. Finally, it was time to get on the river! Our group launched from Deerlodge Park boat ramp and traveled 10 miles down the river to Tepee Hole campsite. At camp, our group broke into five smaller groups of four to five students to take on various camp tasks each day. It being our first night at camp, we first learned how to set everything up: firelines to unpack the boats, handwashing stations, dishwashing stations, and of course, a memorable rap about how to properly use a “Groover” (backcountry toilet). We had time to relax at camp and some students even ventured to scout Teepee rapid for the next morning. Day two opened with our first bigger rapid, Teepee. SUPs were everywhere!! Whitewater stand up paddle boarding or, SUPing, is a newer sport and definitely one for adrenaline junkies. Some members of our group really got the hang of it quickly and were able to glide through the rapids – others struggled. However, everyone who gave it a go really seemed to enjoy the new experience, and I think we created a few new avid SUPers! We hit a few more rapids throughout the day and eventually arrived at our campsite, Harding Hole 1. At camp, we all took some time to set up before going on a hike. This hike concluded with a beautiful view from the top of the canyon. To start out our third day on the river, we had a short hike up to Signature cave. As we approached the cave, Professor Gibson was joined by Charlie Newton in drumming inside its walls so that the sound echoed throughout the canyon, creating a mystical vibe. In the cave, we learned a little bit about the history of the river and its first river runners. Following the history lesson, Sommer Swasey led our group in yoga. After some miles of river, we stopped for lunch and went on another hike. This time to see Fremont ruins. The Fremont culture dates back 1000 years. This tribe was a nomadic people that did not build permanent dwellings. They did, however, leave behind pictographs and petroglyphs. Our hike led us to Mantle Cave, which is where the Fremont people stored their food. They came from all over the canyon to this cave to get the food that was stored during harvest. Now, there are only pieces of storage creates left behind, and it is up to visitors to stay on the designated trails so that everything stays intact. After miles of flat river, we approached Tiger Wall, an impressive face of the canyon that towers above the river. In preparation for the upcoming Warm Springs Rapid – an intimidating class 4 rapid – we all stopped to kiss the Tiger Wall. This is a long-followed tradition to ensure a boat’s safety in the rapid. Past Tiger Wall, we began to hear the rumbling of the rapid. Together we all went to scout the rapid and watched as other boaters successfully ran it. Soon it was our turn; boat after boat successfully ran Warm Springs. At camp, there was a group-wide feeling of euphoria. Camp for the night was at Box Elder, and boy, were we lucky to get that campsite! That night, it hosted the 2nd Annual Yampy Campy Talent Show. Hosts Shelby Deutsch and Hunter Grant were glad to see us, seeing as no one showed up to the 1st Annual Yampy Campy Talent Show. Students were able to open up and share their hidden talents with the group. Between each performance, Shelby and Hunter created hilarious skits and even got our instructors, Mark Gibson and Annie Westbury, to make an appearance. After the course, Hunter reflected on the talent show and how it was one of his favorite parts of the course. It involved getting out of his comfort zone and he realized that with this course: “You get out of it what you put into it. This is a trip that’s not structured like any other trip I’ve ever been on. And so, you can sit back and kind of hide in the shadows and just get through it or you can put yourself out there and make mistakes and find yourself in a position you don’t [think you] want to be in but you’ll learn a lot more that way and have more fun…Don’t just try to get through the course, be a part of the course.” Following the show, talents continued to flow as our group huddled around the fire and sang into the night. The amount of talent within our group was extraordinary. The next day was our last stretch of the Yampa, because we would be reaching the confluence. Once we had the boats packed and ready to go, one of our guides Mike Utley gathered us together to explain the day. We would be starting with a silent float from camp to the confluence. To set the mood, he read us a poem aloud called the “Hopi Elder Speaks”. The whole idea of the poem is to reflect on your life and look at what parts need to be changed. This became a very powerful, reflective experience and I am grateful to Adrift for facilitating this moment. Once we reached the confluence at Echo Park, our silence was broken with drumming by instructors in various boats. Everything we experienced on this trip is thanks to the efforts that prevented the damming of the Green River in the 1950s. If the dam had been built, no one would be able to experience the magic of the Yampa. 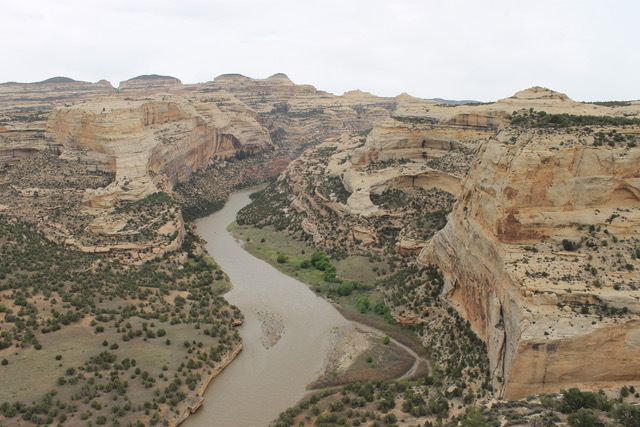 The Yampa is the last wild, or free flowing, river in the Colorado River system. Because it is wild, it has a rich, healthy ecosystem and it is home to endangered fish species. It is important for all those who experience the Yampa to become activists on its behalf. History repeats itself, and this battle will need to be fought again. Dams, in general, are not good for rivers, and new dams need to be avoided at all costs. We need to keep the magic of the Yampa alive so that many more generations can experience this life changing trip. We need to keep the Yampa wild!